Just found some paperwork, and realize I have been using SimpleDNS for over 13 years ... rock solid the entire time, serving millions of queries ... I can't think of another solid reliable software that I run for that long. Really the best DNS server on Windows platform. Having about 20 000 domains, just running. A very clean API. Very good plugins, like GeoDNS. Doing a great job. We are an happy hosting company with this product. Having used Simple DNS for over 10 years in the hosting industry it is still my first and only choice for DNS on Windows. This software is fast, feature rich, stable and integrates with hosting platforms. Simple DNS has served such an important service we depend on every day without a hitch! A big thanks to the Simple DNS team for making our lives easier. Thank you for helping us launch! 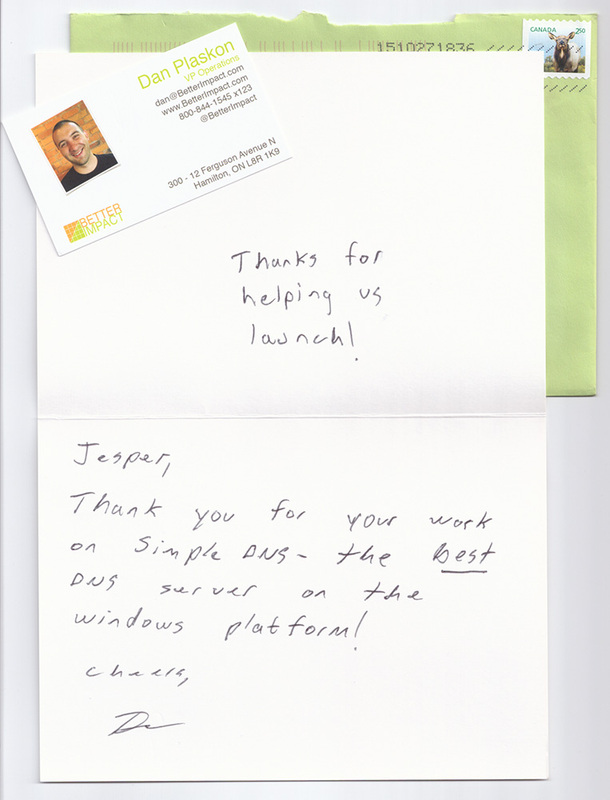 Thank you for your work on Simple DNS - the best DNS server on the Windows platform! Simple DNS Plus is very stable and user friendly. We are using this program for almost 10 year without any problems. The management of secondary name servers is fast and reliable. The best DNS-program for the Windows platform. Easy, fast and the best. Your software is great. Stable and very convenient to use. I had several IP addresses to change on about 200 domains and that's why I upgraded to v. 5.2. It took me a few minutes while it would have taken hours on Microsoft DNS for example... Brilliant! Simple DNS Plus is a fantastic and affordable product. The part that continually impresses me the most, is the support. Simple DNS is easy to administer our 30'000 Domains and works very quick and very stable all time. Nice job, Thanks to Simple DNS Team! SimpleDNS has provided rock solid DNS services for our company for many years. Our customer's depend on us to keep their Internet related services running smoothly and with SimpleDNS we rarely worry about any DNS trouble. A lot of time and effort has gone into this product and it shows! We have been using Simple DNS for over two years. It has never failed us. Looking after 30000+ domains and increasing rapidly was quite a nightmare until we started working with Simple DNS. Our experience with Simple DNS has been nothing but smooth, clean and stable. When it comes to Windows based DNS services, I have never found anything to be as fast, comprehensive, and easy to use as Simple DNS. Thanks for such a great product and your active contribution to the web hosting community. Top class software, we've been using it for years and never had any problems. I'd highly recommend this software to any Windows administrator. Thanks. Simple DNS truly pays for itself. The synthesized DNS records feature makes me over $100.00 a month from DomainSponsor by redirecting abandoned & unused domains that have been pointed to us, but are not actually used as a hosted/alias domain. Instead of taking up valuable resources, I get reimbursed. Thanks for such a great product and your active participation in the web hosting community. I just have to say that getting support from you guys has always been hassle free. I really appreciate your quick responses and the fact that you don't nickel and dime people for tech support. All of this on top of the fact that you have a great product. Keep up the good work. Being a mid-sized company, we do not have the technical resources to know every aspect of specific systems such as DNS. After researching for an easy to administer solution, JH Software's Simple DNS Plus was the clear choice. Although the price of this product made it attractive from the start, it turned out to be the easy of use, usable features, excellent documentation, and integrated help that won us over. Simple DNS Plus is exactly that, it's simple, simple to use, simple to understand. We tried several other DNS product, none where a EZ or simple to install and use. And best of all, when needed the company has been very responsive to input. JH Software continues to upgrade and enhance the product, currently we are Beta testing version 4, and are looking forward to it's final. We use Simple DNS Plus in our Service Provider for more than 1.000 web sites zones and this software has incredible performance and stability, congratulations for JH. Simple DNS Plus is a great product. We use it to host clans for netgaming and we are very satisfied. As an Security Specialist SME who aided the development of the INET+ Certification, I am very pleased with the JHSoft's DNS server. Fast, effective, and user-friendly. With everything a corporation or smaller site would need to host zones. I use the Server to run my private Websites, and recommend it to all via my company NISecurity. Reliability, Simplicity, Value and Must-Have. I'm talking about "Simple DNS PLUS". We have recommended it to all our ADSL fed clients for over a year now. It pays for it's self quickly and we never get clients on the phone having problems. Don't think about it. Buy it!!! Very good tool, since I did a migration from one server to another I just copied the DNS files. Genial, easy to use, easy to understand. It's a must have. I've had nothing but good luck with Simple DNS Plus! The documentation and online support is second to none. Turnaround time for e-mail support is very timely. Way to go JH Software! After watching a colleague struggle for a year with Microsoft DNS, I decided to have a look around for alternatives when it came my turn to implement DNS in October 2001. I found Simple DNS, installed it and started using it immediately on a few dozen domains. I have never looked back. I recommend Simple DNS wholeheartedly and have added it to our short list of recommended products for any server owner. Simple DNS Plus is very stable and user friendly. We are using this program for almost a year without any problems. The management of secondary name servers is fast and reliable. The best DNS-program for the Windows platform! We have been using Simple DNS Plus for over two years. It has never failed us. We host tons of sites and it has saved us lots of time and money. We run several Windows 2000 DNS servers as secondary servers and use Simple DNS plus to manage our large collection of domains. Like some others I even added a web based interface and can now offer management of individual domains to their true owners - securely. Simple DNS Plus is the best solution you can find for DNS management. It's not just the fact that it works with ZERO ERRORS. Is the wonderful fact that you can setup domains in SECONDS, you make changes in SECONDS, you can delete any domain in SECONDS and you can manage anything related to your DNS server with the more speed possible. modifications using PERL, ASP, PHP, etc. I've been using Simple DNS Plus for a year and i have to say that I just love it. It is the most well wasted money I've made for my system. About my English, I'm sorry. I speak Spanish. I have used Simple DNS for 2 years now, and I can tell you that it is a great program. I run web servers and Simple DNS lets me concentrate on other problems because I have never had any problems with Simple DNS. Don't let the name Simple fool you, it is powerful, and at the same time easy to use. We develop and host web sites, and it is very important to have a complete solution to provide the best services to our customers, and with Simple DNS, we can provide those services. It was transparent to our customers setting up, and very simple to install and configure. We were fortunate to find Simple DNS, and look forward to years of service. I'm using this product for over a year now and it didn't disappoint me once! It is a great product which can easily be used especially because it has lot's of, easy to manage, configuration options. When you want to automate things it also has many options which make working with DNS a lot easier! We have used Microsoft DNS for years, but when our website was upgraded, we found Simple DNS Plus the right choice. Simple DNS Plus is very easy to administer. And it handles the large volume of name server lookup from both internal and external hosts very well. It has been running for more than two months now without a single glitch! Thanks JH Software and keep up the good work! After searching for months to find a reliable DNS server that can do everything we needed, we found Simple DNS Plus. This is the best product I have ever seen. We were able to setup our domains (over a thousand) and everything works great. Keep up the good work JH Software! The VEVIDA.NL hosting service found out about this great product of yours. Currently our secondary servers are running with Simple DNS, but in a short time we plan to upgrade the Primary servers as well. We also plan worldwide VEVIDA.COM deployment of this product since it's exactly what a Win2k-based ISP needs. The DNS service we were paying for went down for more than four hours during a site promotion we were having. We can't even fathom the business we lost because of this. Fortunately, we found Simple DNS Plus which allows us to manage our own DNS information in house. We thank you for developing such an easy to use but powerful product. In my search for DNS servers to Windows NT platform, I found the Simple DNS Server to meet my requirements. And after a few tests there was no doubt that this was DNS server I was looking for. It has a lot of great features which simplifies the daily administration of a DNS server and it also has great performance. Brilliant software. Simple to install and manage. 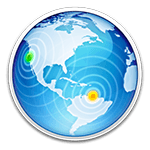 I would recommend this product to anyone wanting to setup their own DNS servers. Jhsoft - keep up the good work. I have been using it for just 1/2 hour and I love your program. It seems to be so easy, and yet so versatile. Great job. 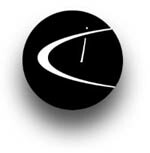 I am the owner/Systems Administrator for an ISP in Lancaster/Logan Ohio. I was turned on to your DNS Program from a friend of mine just tonight. I liked it so well that I bought it immediately and set up my whole ISP in about 10 minutes. All I can say is "GREAT F... PROGRAM"! Best DNS program for Win based computers I've ever seen! Thanks for the great progy. Now maybe I won't have to shift things towards Unix based OS. My experience with Simple DNS has been nothing but smooth. Why deal with cryptic DNS tables when I can have a GUI do the same job for me. Before Simple DNS I used another GUI DNS program. This DNS program had many flaws in it, especially when I wanted to reload the DNS files after making simple updates. As for Simple DNS I am happy to see the update for use as an NT Service. For now I can only say that Simple DNS is a very well structured program which is simple to use and maneuver through. Thanks for the awesome program.